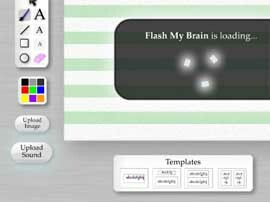 Flash My Brain - Study and create talking flash cards and music flash cards. 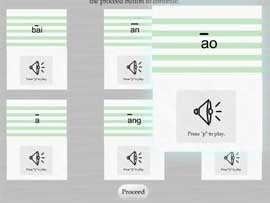 Study and create talking flash cards and music flash cards. Flash My Brain helps you create and learn with talking flash cards. Flash My Brain's sound flash cards can help you learn a language with the correct pronunciation. You can use music flash cards to hear intervals and practice identify themes. Flash My Brain for the iPhone is the perfect place to study these cards. You can download any set you make on the computer onto your iPhone or iPod Touch and study away on the train, on a plane, or under a tree. Flash My Brain fully supports mp3 sounds. 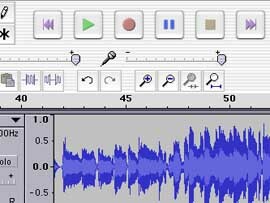 That means you can use GarageBand or free programs like Audacity (pictured here) to record your sounds. Music teachers, create sound sets with different percussion instruments to help train your students' ears. Or record some basic Italian phrases for your friend traveling to Europe! You have your sounds all recorded and Flash My Brain is 100% ready to accept your mp3s. Click the upload sound button in the full editor and your sound will zip up to the flash card database. 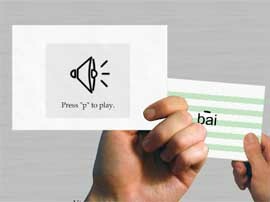 You can even create two-sided audio flash cards. One side of the talking flash card could be English, and the other side the Korean translation. What a boon for aural learners! Now your new talking flash cards are available to your students, friends, and fellow Flash My Brain users to learn! Once you're a Flash My Brain user, feel free to peruse the existing library and profit from existing audio flash card stacks. Click here to buy Flash My Brain for $29.95 and start enjoying audio flash cards.